As we move through life, we will at times look back fondly at memories that we hold dear. And, as gamers, many of us merge recollections of the virtual world with those of reality. Some titles simply bring the right elements together in the perfect way, making this feel natural, normal, important. One game pulled this off better than most that came before – perfectly, some might argue. Since we found ourselves in Hyrule Field more than a decade ago, many of us have closed our eyes during difficult times and imagined ourselves there once more. 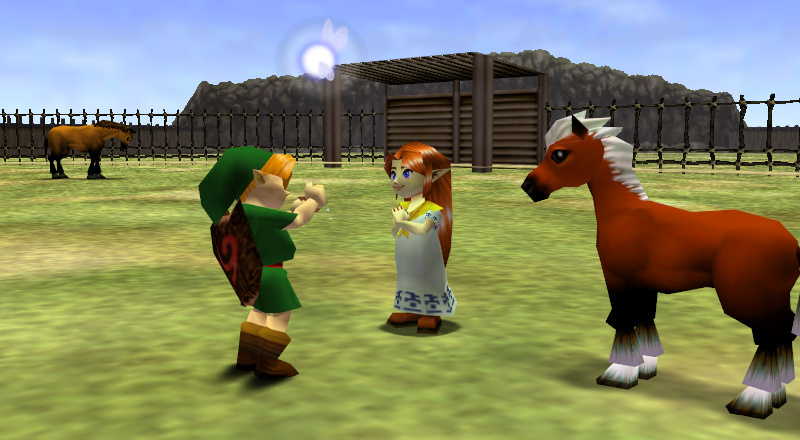 As we look forward now to The Legend of Zelda: Ocarina of Time 3D, we take a look back to that incredible, moving game, to ask why it worked so well, changing the way we look at the potential of video games to transport us to another world that feels as real as our own. 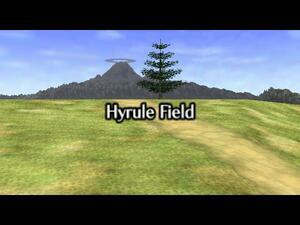 It says a lot about Ocarina that Hyrule Field in particular, so vast and relatively empty, could feel so special. In a lesser game, it would amount to exactly that – a big, empty field. Like the bridge of a song or the silence before a storm, the pause possesses weight and substance. A well-orchestrated script says as much during the silence that breaks up dialogue and action as the dialog and action themselves. And if Ocarina is one thing, it's well-orchestrated. Hyrule Field is the first thing we see in the game, the camera sweeping through as Link rides Epona across and the incredible soundtrack plays. Death Mountain looms in the distance, the castle stands on the horizon, and the gamer cultivates a sense of expectancy. In the vast world of Ocarina of Time, suspense plays a lead role. It comes with Navi's more cryptic hints, with the warning that any forest dweller who leaves will perish, with every townsperson who ambiguously mentions the path ahead. One of the most iconic images from Ocarina and the Zelda titles that followed is that of approaching: Link approaching the Great Deku Tree as he comes into full view, Ganon approaching on his horse as he makes away with Zelda, our hero approaching a glowing treasure chest. The sound that accompanies the latter is even more familiar – not just that which accompanies the object's unveiling, but the music that builds as the protagonist slowly opens the vault. What's about to happen in this game is always as important as what's currently occurring. And of the former, the possibilities are ever-emergent. Rarely does the game force you toward one task without any other options – there's almost always townsfolk to meet and interact with, cuccos to gather, farmers to find and wake up and more, usually for the reward of a piece of heart or a cache of rupees. Ocarina is as gradual as you like – you take things at your own pace, as slowly or quickly as you choose. Just like in life, you discover your goals instead of them being thrust at you. This subtle direction is one more element that helps make Link's adventure feel so real. Is there really any point to this article??? This game had a huge impact on the Zelda series and videogames in general. Every bit of it is amazing to behold. I remember that first time stepping out into Hyrule field and just staring in awe! I was hooked for months. Only stopping to eat, sleep or go to the bathroom. @3DSneedsRPGs Lol I agree. But I do appreciate how creative zelda games are (besides Twilight Princess, which stank). Hyrule Field felt really out of place in a Zelda game. The series was better when it was about exploration. "he camera sweeping through as Link rides Epona across and the incredible soundtrack plays. Death Mountain looms in the distance, the castle stands on the horizon, and the gamer cultivates a sense of expectancy." "(Some spoilers, then) ...this is such a grave offense that propels you on your quest more than a simple directive would." "In the real world, no one is a minor character in their own lives, a feeling that transcends to the population of the game. It pulls it off so well that even a big empty field feels special"
Also, i identified myself in there more than once. Hm, I know I'm a bit odd on this point, but I was never impressed with the storytelling in OoT, mainly due to the actual text. Compared to the dialogue in other story-heavy games of the series (Majora's Mask, Link's Awakening, Wind Waker, and yes even Twilight Princess) the characters feel stilted and never particularly well written. I'm sure much of this depends on which Zelda games you played first. My experiences with the original LoZ, and then Link's Awakening years later, were full of mystery and discovery in a way OoT just didn't capture for me. Then Majora's Mask made far more ingenious use of the OoT graphics and engine, so OoT just sort of got left behind as a transition. However, I will say that OoT has some incredible dungeons, and that alone makes it a great entry in the series. More TP hate... I can understand if it's not your favorite in the franchise but you should at least recognize that it is a pretty solid adventure game. I have recently been playing this game again on the GC Zelda Collectors Edition and its actually been a few years since I played it, the last time I actually played it is when I got it on my N64, and I have to say I am still awed by it today as I was 15 years ago. I feel Zelda games in general are very solid and what they do is done well (for the most part). In some ways though it's like pop music. The game appeals to a large audience. I grew up playing Zelda games from the beginning and the world's have been very small and almost claustrophobic. There is also a great deal of linearity to the games. There are some sidequests, heart containers and such, you can play out of order but it requires getting items from temples first. On the one hand I'd love to see the Zelda mold broken. Introduce more towns, more swords, armor and boots, hidden places and items not required to the completion of the game, maybe some sort of leveling up system, I'd also love to be able to jump on command rather than as a context sensitive button. On the other hand Twilight Princess had a lot of almost useless items. The slingshot was replaced by the bow early on in the game despite staying in your inventory, other items I rarely used. While OOT was a great game I was always a bigger fan of Link to the Past. Despite some of the great features 3D brought to the game the world in LTTP was a lot more interesting. "Is there point to this article?" Is there a point to waterfalls? Is there a point to poetry? Is there a point to to the endless flow of time? Not every article has to be a news bit. I greatly enjoyed this piece. Nice read Zach. I feel ashamed for this, but the first Zelda game that I ever played was Phantom Hourglass. It wasn't the worst game ever, but in my view, the worst Zelda title, but I haven't had the chance to play some of them. 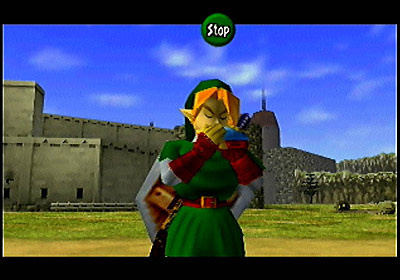 However, the next one I played was Ocarina of Time. It was the best game that I've ever played. My mom even liked helping me figure out the puzzles and things. She liked It enough that I was able to convince her to buy me Twilight Princess. Ocarina of Time alone has led me to get EVERY selda title after it. I am DEFINITELY getting OoT 3D and Skyward Sword. Beautiful. I love this game. Welcome back, old friend. And here's hoping for Majora's Mask 3D some time soon after. And maybe... Wind Waker? Still as great a coming-of-age fantasy epic as it ever was. What makes Ocarina of Time so special is not just the fact that all the individual elements, even the tiniest, least important ones, are executed so well, but also the way they blend together seamlessly. My brother is playing through this game for the first time, so I get to see the experience firsthand. I grew up on Zeldas like Wind Waker and The Minish Cap, but I can understand why people find this game so nostalgic. I grew up on this Zelda game. So I'm not that old. I really enjoy every Zelda game since they are all the same just with different flare and different challenges. Each with its own unique story. @4 you my friend are right! Great article, Zach! You managed to capture what the game is truly about. I had a great time playing it for the first time in 2009 (unlike many, it was on the Wii's VC rather than the N64). It's a gorgeous game, though compared to other Zelda entries, I feel that some of the characters were a bit... incomplete. There were many characters that were great at showing their personality, like Malon, Darunia, and that Gerudo commander (forgot her name), but others like Princess Ruto I felt were a bit shallow and not well-written. I guess I have to partially agree with what warioswoods said about the script. And I guess that's why Ocarina of Time is NOT my #1 fav game of all time, though it is among my Top 5 at the very least. @8 he just ment that twilight princesss was slightly less creative because your in the same place going to the same places youve already been to in ocarina of time. But it WAS different because you did different stuff in the game. Thanks for all the nice comments everyone. I'm just back from my honeymoon and I'm glad to see people enjoyed the article. Now, off to play in 3D!